Pinot Noir rates a close second to Chardonnay in the ‘varieties likely to be drunk first at Graham HQ’, which usually means that samples are finished rather than given away. In other words, Pinot is popular in my house. Anecdotally, Pinot Noir seems more popular in general, with more demand than ever before. The only challenge is that we’re not actually making more. 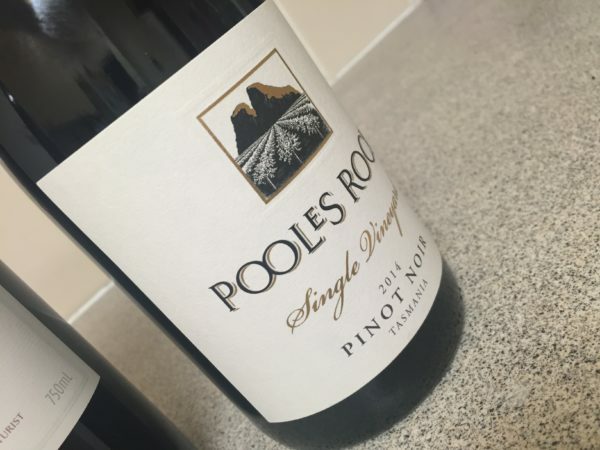 According to the ABS ‘Vineyards, Australia’ report that tracks wine grape variety production, there was just 2,000 tonnes more Pinot Noir produced in 2015 versus 2004. Compare that to Sauvignon Blanc, which went from 62,000 tonnes in 2008 to 83,000 tonnes in 2015 – a circa 33% increase. This blindsided me. I took one look at the producer and thought ‘Hunter winemaker making Tassie Pinot – this isn’t going to workout’. How wrong I was. Sourced from the Coal Valley, it’s a light and well formed affair with lovely delicacy. Ruby red. the nose is lifted, lightly herbal over redcurrants. After an airy start, the palate is surprisingly firm and serious, a lacquer of vanilla oak over some buzzy, classical acidity, and more dark fruit (and a suggestion of stems?) weaved through finish. Limpid fresh, light – yet not unripe – low alcohol wine that has length and plenty of style. Best drinking: 2016-2022. 18/20, 93/100+. 12%, $65. Would I buy it? Price is up there but I’d happily drink most of a bottle. Another new wine from Matt Burton (Gundog Estate) and Dylan McMahon (Seville Estate), with fruit sourced from the Syme on Yarra vineyard in the Upper Yarra. Ruby red, the joy here is all about vibrancy. Baked cherry and raspberry fruit, the palate bony, stemmy and yet succulent, the late bloom of red fruit putting skin on the tannic bones. I love the structure here, those tannins and the fresh red fruit rather addictive, even if it’s a little lean through the middle. Quality juice and well priced. Best drinking: 2016-2022. 18/20, 93/100. 13%, $36. Would I buy it? I’d happily buy a bottle off the list. At this price it’s a no-brainer. Each year Brian Croser’s Pinot gets a little more impressive. This year, crucially, there is a balance between the dark plum fruit flavours and a proper Pinosity. It’s still a ripe, firm, and full-flavoured Pinot that is a distance from the lithe and delicate styles of the two wines above, but it has length, weight and power. If you like the more robust Martinborough style rather than Central Otago, to use another Pinot yardstick, then this is going to be right up your alley. I quite enjoyed the tannic length and palate density. Best drinking: 2017-2025. 18/20, 93/100. 13.8%, $55. Would I buy it? I’d like to have a few bottles in the cellar to see what happens. This comes from the original Jim Jim vineyard at 750m in the Macedon Ranges, a famously cool site which has traditionally been more about fizz than table wines. But this doesn’t look light or skinny. Indeed the nose is quite robust, vanilla oak a fraction dominant, but the sappy fruit underneath is surprisingly powerful, the finish just a little prickly. I like the sensation of contained ripeness here – it feels like a balanced wine. Now, if only the oak would integrate a bit more and we’d be in business (Diam sealed). Drink: 2017-2023. 17.7/20, 92/100+. 13.5%, $50. Would I buy it? Maybe not yet, but I’d like to see a glass in a years time. 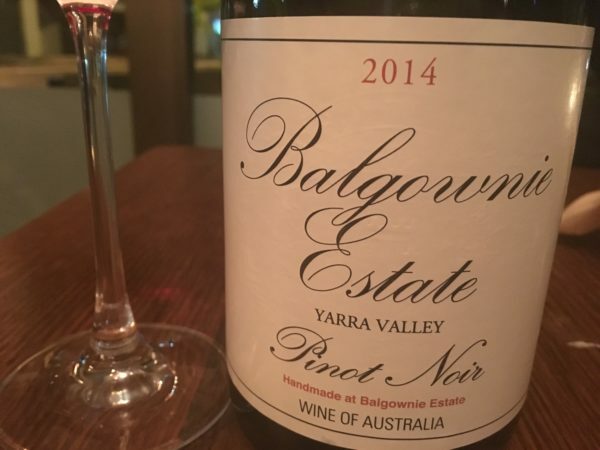 Not sure if I’ve missed something, but this is the first Balgownie Estate Yarra Pinot I’ve seen with a white ‘Estate’ label. Serious intentions too, although spends just 9 months in 30% new barrels – Clearly winemaker Tony Winspear is after less oak influence (Hi Tony). Certainly no oakon the nose, which has tomato leaf and black pepper in amongst pomegranate and raspberry fruit. The sappy, acidic palate is a curious one, the full red fruit reminiscent of something riper and more alcoholic, the light and slightly lean finish confounding that idea, before then tasting warmer than 12.5% as an aftertaste. A curious wine then, the style pretty clever if just a bit skinny. Should be a better wine in 12 months time too. Best drinking: 2017-2022. 17.5/20, 91/100. 12.5%, $45. Would I buy it? I’d drink at least two glasses. What a contrast to the Pooles Rock! Dark ruby, this is ripe and quite oaky, the sweet, vanilla bean oak sweetness obscuring the strong and ripe dark cherry fruit – a little less oak would be great here. Otherwise this is quite extractive and firm, every bit the Shiraz makers Tassie Pinot. There’s plenty to chew on though and the length says quality, even if its just a little blocky now. Best drinking: 2017-2022. 17/20, 90/100. 13.5%, $45. Would I buy it? Not yet. This is one of the entry level wines for Mud House, but still very much looks the part. Nice aromatics – a quite ripe and juicy expression of Central Otago fruit. Palate starts well, but heavy handed oak and a broad middle doesn’t help to really carry the wine, capped with oak tannins. Plenty of style here, if not quite the follow through. Still entirely drinkable and fairly priced – ticks plenty of boxes. Best drinking: 2016-2021. 17/20, 90/100. 13.5%, circa $26. Would I buy it? I’d drink a glass or two. Ah the ever present quest for delicacy in WA Pinot. Abbey Creek do it better than many, but if it was me I’d just graft my Pinot over to Shiraz. Anyway, this light ruby coloured red smells of raspberry fruit but with a deep and more masculine, ‘we’re not in Burgundy any more’ edge, topped with just a little eucalypt. The sweetness of the vanilla oak helps lift that quite dark fruit to something quite affable, but the warm and dry finish gives this a hard edge. Good attempt, but just too firm edged to love. Best drinking: 2016-2023. 16.8/20, 89/100. 13.5%, $28. Would I buy it? Not quite. This is comes from an established vineyard at Yarra Glen. Dark ruby with light edges, this is unquestionably a ripe year Yarra Pinot, the fruits tending towards dark cherry with a dash of eucalypt. A firm, slightly minty and meaty palate doesn’t give much and seems just a little stunted by alcohol (even though it’s just 13%) and the finish seems rather short. There’s some perfume here, but it just feels a little resinous and lacks carry. Best drinking: 2016-2022. 16.8/20, 89/100. 13%, $45. Would I buy it? No. New packaging but the same pricetag – as solid value as ever. Ruby red, it’s bacony and quote ripe for a Yarra Pinot with dried fruit edges. For a budget red there is a strong core of dark red fruit and surprising warmth, the finish, again, surprising for a wine you can pick up for sub $15.. Good Pinot style; just a little lacking on the finesse. Best drinking: 2016-2020. 16.5/20, 88/100. 13%, $16.99. Would I buy it? No, but I’d recommend. “Hunter winemaker making Tassie Pinot”. Whom also makes banging Fixin.